I know summer doesn’t officially start for another few weeks but in the US, Memorial Day is the unofficial start to summer! For many school districts it is the end of school. But the summer is not really a slowing down for many folks! Though some of our members are on less than 12-month contracts, many do work throughout the summer. The summer months — and there really are fewer days than there used to be with so many schools starting in July now — are full of all the activities around closing the previous year and the planning for the coming year! I hope you were able to at least take a breath and remember why we even have Memorial Day. Memorial Day is the U.S. holiday to honor those who gave their life in service to their country and certainly we should be remembering that great sacrifice! We have a special request for input on a draft document on Maltreatment. In November 2017, the CEC Board of Directors approved the establishment of a workgroup to develop a CEC Policy on Maltreatment. Catherine Corr, University of Illinois, serves as chair of the workgroup. The ten-member workgroup met for the first time at CEC 2018 in Tampa, FL., and has met via conference call at least two times per month since then. The policy will be considered for final approval by the Board on July 10, 2018. Would you take a few minutes to read this document and then send me your answers to these three questions? Speaking of needing your help... I know I sound like a broken record but do you know we have not received one single nomination for the CASE Early Career Special Education Administrator Award. This award will be presented to a Special Education Administrator who is a member of CASE and in their first five years administering special education programs and/or services, and who embraces 5 of the pre-selected values of the 17 Gersh Values. The nomination should be sent to CASE Membership chair, Dr. Julie Bost (NC) at 40 Windrift Court, Gibsonville, North Carolina, 27249 336-847-0749 by June 30! Information can be found on the CASE website or download the form above! We only have a few more weeks and think of what a great boost to a person's career it would be to receive such an honor! Speaking of time running out... There are just a few more days to sign up for the CEC free webinar. On May 30, CEC will host a complimentary webinar entitled, "Setting the Foundation for the Future of Special Education." Join the co-chairs of CEC's Standards Development Workgroup for an informative webinar about the current revision work to strengthen and refine CEC's Professional Preparation Standards. In this FREE webinar, learn about the direction and process for this critical initiative and preview the current draft of the future CEC Professional Preparation Standards. Don't miss this opportunity to be engaged, informed and directly involved with the development of the Professional Standards that shape our field of Special Education. This webinar is FREE! Make sure you're logged in to your CEC account (or create one! ), and continue with the registration process. If you have never gone to the Hill to advocate, let your first time be with us! We need every state to be represented! The time is now to register for the CASE-CEC Special Education Legislative Summit... CASE has been doing a legislative summit for 16 years! For the last 3 years we have partnered with CEC to increase our footprint up on the Hill! All the information you need to make an informed decision is right at your finger tips at the SELS website. I strongly encourage you to add the bus transportation to your registration as the D.C. Metro seems to always be under construction right now — the bus into the D.C. for that Tuesday is the least stressful way to go! I always encourage folks to take advantage of the great location and hotel rate and bring your family/friends — come in early or stay late and do some sightseeing. There is always something new to see in D.C.! But most importantly, we want to have special education administrators from EVERY state represented in our SELS. Last year we had over 250 people from 44 different states up on the Hill advocating for students with disabilities! We need you! Check out the information and add this to your professional learning budget! We had a really nice response to our poll this week... 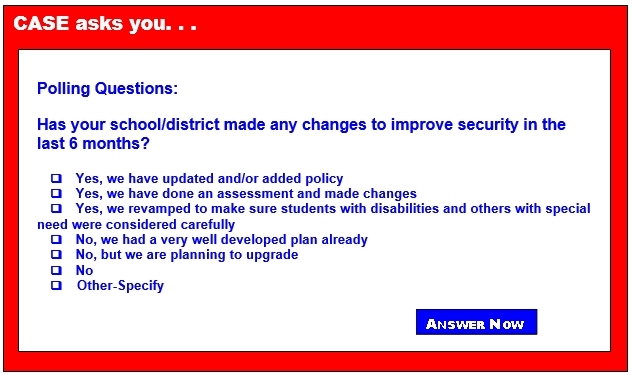 The question for this week was "How many years have you been a school/district administrator?" First place at 29 percent was 16 to 20 years as an administrator. Right behind at second place with 24 percent was 11 to 15 years. Third place at 18 percent was 6 to 10 years. So that means over 70 percent of those answering the poll have been an administrator for 6-20 years! Fourth place at 12 percent was 1 to 5 years. There was a three-way tie for last place at 6 percent between 21 to 25, 26 to 30, and 31 years or more! I am actually encouraged that the vast majority of you have been serving for 20 years or less! I hope you will be around for many more years. I also hope you will consider becoming more involved in both your state/provincial CASE unit and your international/national unit! We need you and we hope you need us. Let us know what we can do for you to make us even more indispensable to your career! I truly want to say again my appreciation for our service men and women who have died in their service to our country. I hope you have or had a great Memorial Day ... and for our Canadian friends and others outside of the U.S., I wish you had the day off today, too! PS... The InCASE Newsletter Vol. 59 No 4 went out on Thursday, May 24. If you are a CASE member and did not receive it, please let me know! In the past, schools have occasionally implemented policies in which students' grades on report cards or transcripts are lowered in the event of behavioral infractions, inappropriate classroom behavior, or unexcused absences. This was used as an alternative to, or supplement to, other disciplinary consequences such as suspension. However, some states have invalidated this policy because it has been seen to violate the school's standards requiring grades to reflect academic performance. While this strategy has been utilized in the past, there is little research regarding its use. In fact, court systems often see this strategy as unconstitutional, declaring that students' grades should mirror academic performance and should not be lowered according to non-academic misconduct. Therefore, schools must consider taking alternative action in the face of student misbehavior.